The Kilusang Magbubukid ng Pilipinas (KMP) and its human rights desk Tanggol Magsasaka strongly condemn the burning of the Lumad evacuation facility of Haran Center by alleged state and paramilitary forces in Davao City today. KMP Southern Mindanao Chairperson Pedro Arnado said that unidentified men torched the dormitory of more than 900 Lumad and peasants evacuees in Haran. Burned was a portion of the facility and the makeshift shelters in the Haran grounds. Five were wounded including three children. The victims suffered burn injuries. “The incident took place at past 2:00AMof February 24 while most of the evacuees were sleeping. We condemn this deliberate plan to kill more than 900 Lumad and peasant evacuees,” Arnado added. The children victims were identified as Magno Kulot (14 years old), Ludicia Dumol (12 years old) and Daimon Manayab (2 years old) who sustained burn injuries in the limbs and in the face. The two wounded adults were identified as Yoloy Manayab (30 years old) and Londia Dumol (45 years old). Jhong Monzon, secretary general of the Pasaka (Confederation of Lumad Organization in Southern Mindanao) reported to KMP that the victims were initially brought to the Southern Philippines Medical Center (SPMC), a public hospital, but were refused to be given medical attention. “The victims were attended and given first aid treatment by local health workers in Haran. The children were traumatized,” says Monzon. Initial reports from the Bureau of Fire Protection of Davao City indicated that there was indeed forced entry into the evacuation center and bottles of gasoline were retrieved in the vicinity of the Haran facility. For almost a year now, the Haran center has been a sanctuary for Monobos, other indigenous peoples and peasants who were victims of militarization in Davao del Norte and Bukidnon. “These crimes against the Lumad people and peasants have escalated to an alarming state. We are outraged with the unabated attacks. Now, even if the evacuees are now hundreds of miles away from their militarized communities, they are still tormented, and worse, hunted by government forces and the AFP-backed paramilitary group ALAMARA,” says KMP secretary-general Antonio Flores who is attending a national fact finding mission to expose the military abuses in Pantukan, Compostela Valley, Davao region. “This crime is another blatant violation of the rights of the bakwits. The very reasons why we have sought refuge in Haran are because of these harassment, threats, killings, and human rights violations committed by military and their paramilitaries, and yet now they continue to invade our sanctuary and inflict terror among us,” says Monzon. 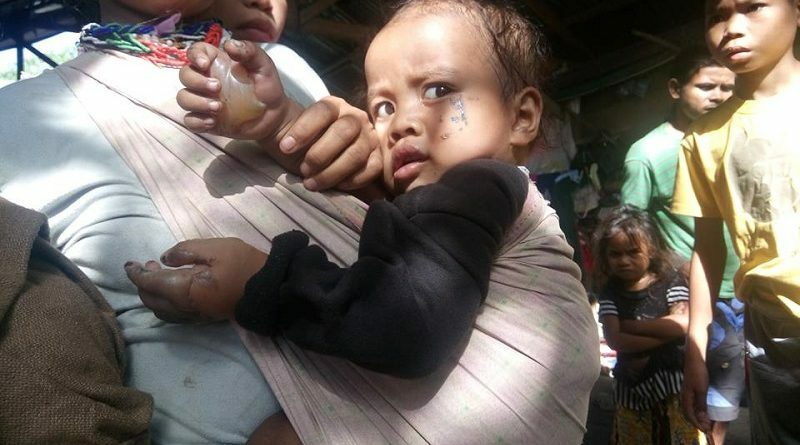 Last July of 2015, North Cotabato Representative Nancy Catamco, along with police, military and elements of ALAMARA attempted to evict the Lumad and peasant evacuees at the Haran Center. The armed men led by Catamco tried to enter the premises, wounded at least 10 individuals and destroyed structures which served as shelter for the evacuees. “Also fresh from the victims’ memories was the incident last December 13, 2015 wherein members of the ALAMARA broke in the Haran facility forcing the people to return to their homes,” says Monzon.